AND ORANGELLO CONTAIN 100% NATURAL INGREDIENTS. The Purest and Most Unique Limoncello Ever Made! Born out of a combination and old-world technique and new-world technology, Sovrano Limoncello has garnered huge international success. 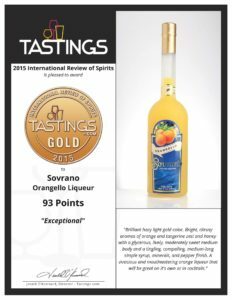 Since 2010, Sovrano has been the winner of 24 gold medals at prestigious spirits competitions around the globe, including being awarded a platinum medal at the 2015 Beverage Tasting Institute in Chicago. 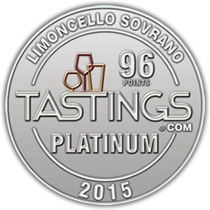 According to Proof66, one of the oldest, most trusted and respected distilled spirits product reviewing and rating agencies, Sovrano is currently ranked as its #1-rated Limoncello in the world. However, only by tasting this product, one realizes instantly why Sovrano is worthy of such high accolades. Sovrano Limoncello is perfect on its own and brilliant in cocktails. It enhances flavors when used in cooking and adds a new dimension of taste when poured over ice cream, fruit salad and pastries. It is a phenomenally versatile adult beverage.